Stunning Breton country cottage in a large secluded garden. Sleeps 2-6. Property 37: Stunning Breton country cottage in a large secluded garden. Sleeps 2-6. A charming, extremely well-equipped and comfortable cottage! I spent 3 and a half weeks in this charming property which is excellently located for exploration of Brittany. My husband, my brother and I shared the cottage for our vacation in June and July 2018. We were very comfortable as the property is has everything we wanted. The owner has restored this traditional Breton house beautifully with every modern convenience. The bathroom is bright and has plenty of hot water, the stove is top-of-the-line, the wifi is excellent and the bedding is gorgeous! There is very little traffic on the roads and the road to the property reminded us of a fairy tale setting, very lush and picturesque. The owner is a wonderful and sweet woman who regaled us with her crepes and Far Breton cake. She has a green thumb and the plantings and flowers are lovely. What more can I say? We would definitely stay here again on our next trip to Brittany. This is a lovely little gite situated near the end of a country lane, close to Fouesnant and only 500m or so from the beach. It adjoins the owner's home and, as well as a private patio/garden, it has use of a separate garden area containing a trampoline and small child's slide. 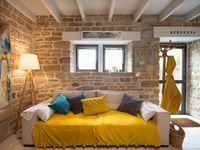 It is in a rustic setting, backing onto farmland, but is also only a short cycle ride away from the local boulangerie (yum!). The gite itself is furnished simply, but stylishly. The kitchen is fairly basic but very functional. The bathroom has a decent, powerful shower which is a bonus. The bed in the master bedroom was a little firm for us but that's a matter of personal preference. Everything was clean and tidy. The owner is friendly and attentive and communications were good. I would definitely consider staying here again if we return to the area.